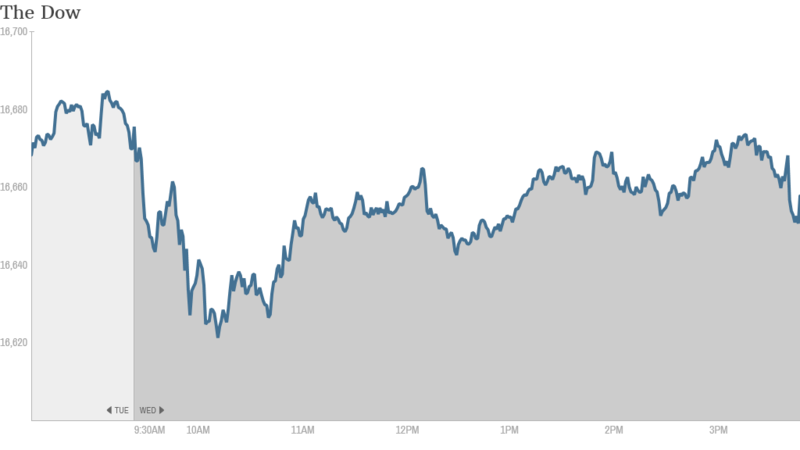 It's been quite the climb for the stock market in recent days, but investors stopped to take breath Wednesday. The S&P 500, Dow Jones Industrial average and Nasdaq all ended the day a shade under yesterday's closes. New record -- barely: The S&P 500 hit a record high on Tuesday of 1,911.9. There was no record close today, although the S&P 500 did tough a new intraday trading record of 1,914 in the afternoon before closing just shy of 1,910. The Dow fell 42 points, and Nasdaq dropped just under 0.3%. Although headlines have touted the record highs notched by the S&P 500 and other indexes, it's important to recall that the S&P 500 is about 10% off the frothy peaks of the dot-com era when adjusted for inflation. Sunken Treasuries: Yield on the 10-year US Treasury note, a global benchmark from sovereign debt, hit 2.44%, the lowest yield in nearly a year. It could be a sign of investor trepidation or the expectation that the European Central Bank will soon take stimulus measures. Tesla downgraded, Twitter upgraded: Tesla Motors (TSLA) got zapped with junk bond status by ratings agency Standard & Poor's, which pegged the electric carmaker's $3 billion in debt a few notches below investment grade. 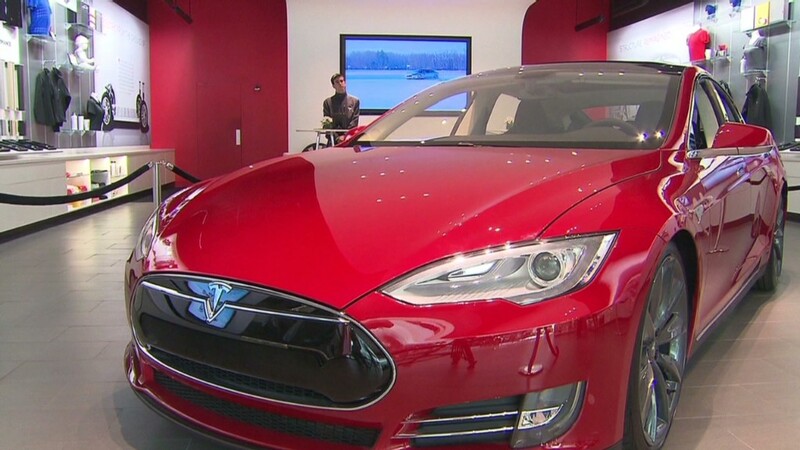 The ratings firm said Tesla's narrow focus and lack of track record were behind the ratings. Shares a flat in afternoon trading. Tesla debt: An electric lemon? Twitter (TWTR) shares, on the other hand, jumped over 10% following an upgrade from Nomura bank. The stock is still down nearly 50% for the year. Retail stocks on the move: Sometimes the shoe really doesn't fit. DSW (DSW), a discount shoe outlet, lost more than a quarter of its market cap in early trading, as earnings came in at the lower end of expectations and same-store sales growth fell 3.7% from the year before. "I've bought every pair of shoes/sneakers I own for the past 10 years at $DSW. Apparently, it hasn't been enough," wrote StockTwits user chicagosean. Michael Kors (KORS) reported results before the opening bell. Profits were a bit better than expected and sales are up by more than half. Kors shares are up more than 17% since the start of the year as the brand seems to be winning the battle for upper middle class purse consumers. The stock jumped 1.3% today. Revenue abroad is growing quickly as well. Sales in Europe were double the same time last year. Homebuilder stocks picking up: Toll Brothers (TOL) reported surprisingly strong earnings before the open, bouncing back from a disappointing start to the year because of the winter weather. Revenue was closer in line with expectations. It was one of the few stocks enjoying a bounce with shares up over 2%. A handful of other homebuilder stocks are also seeing some small gains as well, including D.R. Horton (DHI), Lennar (LEN) and PulteGroup (PHM). Airline companies continue to soar: Delta Airlines (DAL)ended the day 2% higher. It continues to be one of the top performers in the S&P 500 this year. Delta recently announced more routes in and out of Seattle as it grows it presence there, going head-to-head in the "Battle for Seattle" with Alaska Air. Southwest Airlines (LUV) is also up more than 2% today.